Area harvested: Data refer to the area from which a crop is gathered. Crop yield: Harvested production per unit of harvested area for crop products. Production (quantity): Agricultural productivity/production is measured as the ratio of agricultural outputs to agricultural inputs. Elasticity of Supply: Supply elasticity is defined as the percentage change in quantity supplied divided by the percentage change in price. Income Elasticity Of Demand: A measure of the relationship between a change in the quantity demanded for a particular good and a change in real income. Income elasticity of demand is an economics term that refers to the sensitivity of the quantity demanded for a certain product in response to a change in consumer incomes. Compound annual growth rate (CAGR): The year-over-year growth rate of an investment over a specified period of time. Wealth redistribution: Central tenet of most modern economies whereby a nation’s wealth is channeled, from those who have more to those below a certain income level, through taxes that pay for welfare benefits. Ghana is the 6th largest producer of cassava in the world in terms of value, with the commodity constituting 22 per cent of Ghana’s Gross Domestic Product (GDP). According to the Food Balance Sheet by the Food and Agriculture Statistics (FAOSTAT), cassava is the first crop in terms of calories intake providing persons who consume it with about 708kcal, with about 24 per cent of total daily calories’ intake. Processing cassava into Gari is one of the most promising value addition activities given the high demand and income elasticity which results in particularly “favorable prices as opposed to fresh roots”. The recommendations enumerated at the workshop were informed by Ghana’s quest to commercialize cassava as prioritized in the Medium Term Agriculture Sector Investment Plan (METASIP,2011-2015), which has led to the formation, development and implementation of the Rural Poverty Reduction Initiative. The Rural Poverty Reduction Initiative deals with the development of the cassava sector and the intensification of industrial processing to increase value addition. With the implementation of the Rural Poverty Reduction Initiative, which took off in April 2013, there have been pilot schemes running in 18 communities within the West Gonja district of the Northern Region, which is considered as the one of the poorest districts in Ghana. The NPP government launched the PSI programme in September 2001, transforming the Ministry of Trade and Industry (MoTI) into the Ministry of Trade, Industry and Special Presidential Initiatives (MOTIP – SI) with the aim of developing its industrial sector policies to champion Ghana’s drive to expand its markets to global levels of competitiveness. The PSIs were originally intended to cover accelerated development for many local products. However, the NPP government quickly realized the huge task involved and decided to focus on developing four items as potential drivers of economic growth and wealth creation and targeted these sectors for special support: textiles and garments, salt mining, oil palm, and cassava starch production. The PSIs were initially located in the presidency and put under the oversight of competent individuals trusted by the President. A general PSIs Secretariat was created, as well as separate secretariats for each of the four PSIs. National coordinators were employed to man each of these secretariats. The PSI-Oil Palm National Coordinator, though under the authority of a minister, reported directly to the President and Cabinet. Later the PSI Secretariat was moved to the sector level, where responsibility for implementation was transferred to the sector Ministry of Trade and Industry. Then, in 2005, the PSIs were incorporated into Ghana’s Growth and Poverty Reductions Strategy (2006-2009) and thus rendered eligible for financing through the central government budget. Despite being mainstreamed into the development pol – icy framework of the national development plan or GPRS II, implementation of PSI projects was still limited, ad hoc and rather ineffective, while regular government and GPRS-related projects were being systematically and incrementally financed and implemented. Very quickly the three other PSIs (textile garments, salt and cassava starch production) pretty much collapsed. Conclusion: Cassava production as at the end of 2000 was 8106800 tonnes. 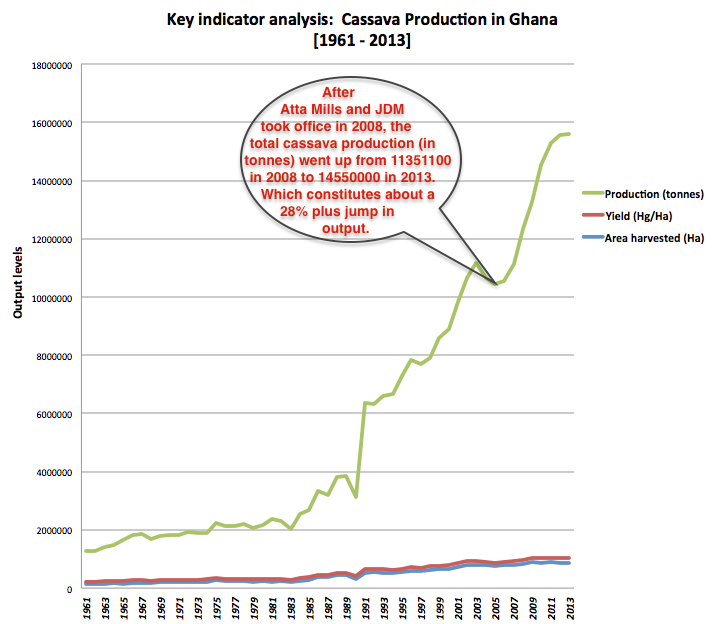 By the time the NPP party left office in 2008, the national cassava production output had reached 11351100. Signaling a 40% (3244300 tonnes) increase in total output over the eight-year period. It could be argued that a 40 per cent increase in the production of a national staple is commendable by all standards of agronomic assessment. Under the NDC government of John Mahama, a few notable policy initiatives have been undertaken in order to facilitate the commercialization of cassava as prioritized in the Medium Term Agriculture Sector Investment Plan (METASIP, 2011-2015), which has led to the formation, development and implementation of the Rural Poverty Reduction Initiative. The Rural Poverty Reduction Initiative deals with the development of the cassava sector and the intensification of industrial processing to increase value chain optimization. With the implementation of the Rural Poverty Reduction Initiative which took off in April 2013, there have been pilot schemes running in 18 communities within the West Gonja district of the Northern Region, which is considered as the one of the poorest districts in Ghana. In December 2012, following the introduction by the Ghanaian government of tax rates that promote the use of local raw material inputs, GGBL created Ruut Extra Premium Beer – a well-balanced, premium clear beer based on cassava. Conclusion: As a direct and indirect consequence of these well coordinated series of policy initiatives by the NDC administration and industry stakeholders, Ghana currently seems to be experiencing a considerable jump in the local output in cassava. When the NDC government took office in 2008, the total national output for that year was 11351100. As at the end of 2013, FAO reported that the total national output, had increased to 14550000. Signalling an almost 29 per cent increase in production increase. So in the final analysis, it could be argued that the Mahama’s NDC administration seems to be heading in the right direction both from an economic policy and development perspective. In Ghana, Guinness Ghana Breweries Limited (Diageo Plc) has been investing in local raw material sourcing, including sorghum, maize and cassava, for more than a decade; working in partnership with local suppliers and farmers, the Ministry of Food and Agriculture, NGOs and researchers to help develop sustainable local raw material supplies, through improvement in productivity of farmers. In December 2012, following the introduction by the Ghanaian government of tax rates that promote the use of local raw material inputs, GGBL created Ruut Extra Premium Beer – a well-balanced, premium clear beer based on cassava, one of Ghana’s most abundant cash crops. Also holds the Diageo record for speed of development: eight weeks from concept to commercialization. Its introduction was made possible due to the Ghanaian government’s progressive policy on local raw materials, which has resulted in concessions on products containing a majority of local ingredients. This innovation also supports Diageo’s ambition to increase local sourcing in Africa, helping support agricultural development and benefiting local smallholder farming communities. Through technological developments and close collaboration with the farming community, GGBL was able to bring to market Ghana’s first commercial cassava beer at a price affordable for a broader number of Ghanaian consumers. GGBL is committed to develop its local procurement in partnership with Government and the local smallholder farming community to provide economic opportunity within the agricultural sector while creating great products for the Ghanaian consumer. Ruut Extra Premium which is almost 30 per cent cheaper than the average mainstream tipple. According to the Agric Sector Annual Progress Report 2013 published by the Ministry of Food and Agriculture (MoFA), the introduction of the beer has provided ready market to cassava farmers. This is partly responsible for the general increase in the area put under cassava production. The MoFA report indicated that as of 2013, GGBL has purchased more than 3,500 metric tons of cassava from local famers mainly in Atebubu (Brong Ahafo Region), Ho (Volta Region), Nkwanta (Volta Region) and Suhum (Eastern Region). The report noted that a total 4,741 metric tonnes of cassava purchased for beer brewing in Ghana, GGBL buys over 74% of them. Having a local supply chain that is resilient is important to the business. Furthermore, you do not have to spend huge amount of foreign exchange to import raw materials. The benefits of local sourcing for the community are extremely obvious. To be connected as a farmer to a business like Guinness Ghana is absolutely important. About 75% of consumers in Africa exist on about $4 a day, a situation that a consumer insight revealed and that led to the Ruut Extra project. It was to deliver quality product at a price the consumer can afford. 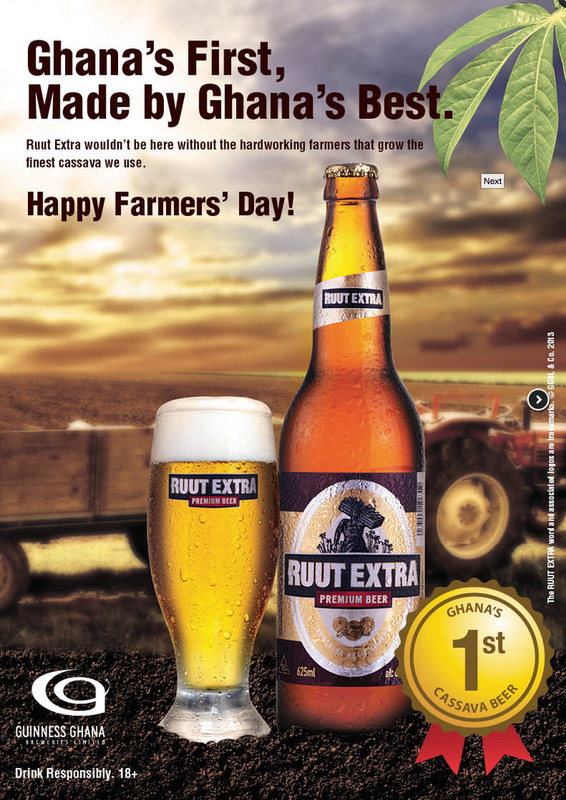 The Ruut Extra Premium Beer has received positive responses from other markets like Nigeria and Mozambique as well. While Ruut Premium is the first cassava beer in Ghana, it is important to note that rival brewer, SABMiller launched its own cassava-based brew – Impala, in Mozambique, as long ago as October 2011. And could perhaps be suggested as giving GCBL the impetus to try the same in Ghana. The population’s rising incomes and low penetration rates attracted global breweries over the last decade, and consumption of traditional malt beer is growing. But the new cassava beers offer a cheaper entry point for the bottom of the pyramid, which represents a huge potential market. Cassava beer can attract the lower -income consumer who can’t afford hops and malt. Ghana’s per capita food and beverage consumption is projected by some analysts to grow strongly over the forecast period between 2013 to 2017, boosted by rising incomes and wealth redistribution. However, the underdeveloped mass grocery (MGR) retail network will hamper faster uptake of premium goods, with the sector yet to attract foreign investment. And the Beer segment is one of the favorites with a 8.4% sales CAGR. 2013 beer volume sales = +8.0%; forecast compound annual growth rate (CAGR) to 2017 = +8.40%. After taxes increased on imported raw materials, the beer industry worked with the government to reduce the excise tax to 10% on beer that uses locally produced inputs. Across Africa, breweries had already found success substituting local sorghum or cassava for malt. Given the limited capacity of Ghanaian agribusiness, securing cassava, which spoils quickly, for industrial use is not easy. Guinness purchases preprocessed cassava root. ABL partnered with The Dutch Agricultural Development and Trading Company, which travels to small farms with a mobile processing unit. 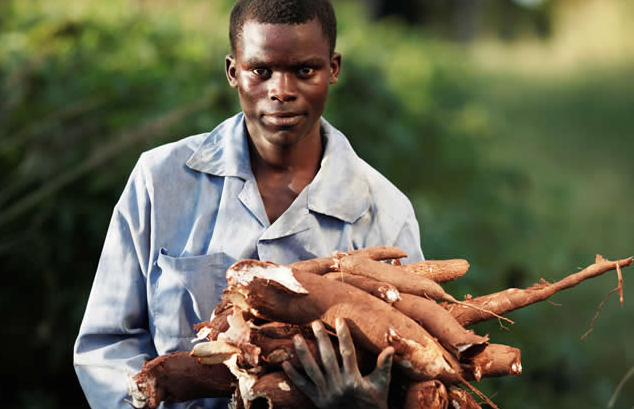 The company buys directly from farmers, processes cassava on the spot and sells in bulk to ABL. It is cheaper to use imported malt rather than local ingredients, but the new excise legislation means lower prices can be offered to consumers if local ingredients are used. Guinness Ghana Breweries produced Ghana’s first cassava beer, Ruut Extra Premium, in December 2012, and in March of 2013 ABL launched its cassava-based Eagle brand. While a malt beer sells for about GHS2.50 ($1.29), Ruut and Eagle go for about GHS1.60 ($0.82) and GHS1.20 ($0.62), respectively. Guinness has already announced a 61% increase in earnings in Ghana over the nine months leading up to March 2013. ABL predicts sales of its cassava beer will be in line with its success in Uganda, where 70% of the beer market is now dominated by local brews. “But now we are very happy with the introduction of Ghana’s first beer Ruut Extra many are now cultivating more cassava,” James Akwetey Moore, farmer based in Suhum said. During the main crop season, farmers now cultivate about 100 to 150 acres of cassava and sell it to factories such as the Ayensu Starch Factory, which the government has partnered GGBL to operate. And it is particularly important to note that this is having an income redistribution effect on farmers since they now have a ready market for their product. These farmers will now be in a better position socio-economically, to afford their basic necessities such as food, shelter, and decent education for their children. Dear Anang, thanks for this – it takes me back to my days as a young entrepreneur in Ghana! I had tried to work on a cassava project – actually cassava and sugar cane project in 1978. Vince Bulla who then worked for Mobil and who became the Minister for Trade and Industry in the Limann government undertook a study of how the company i worked for could reduce its dependence on foreign ingredients and therefore schedule our production better instead of having to wait for long periods for glucose and sugar the main materials for our production of hard boiled sweets at Go Ahead. We invested heavily in a farm at Asutuare so that we could get our sugar cane processed for us and also in a farm to produce cassava from which glucose could be extracted. we were going to have to set up a factory to produce the glucose and eventually abandoned the project; the main bottleneck was who to sell the glucose to – we were not in that business. but we actually knew that another by product of our venture would be starch that could be sold to the many people were involved in textile production. Thanks for your contribution. Starch is definitely an important industrial input, especially in the textile industry which back then was a bigger contributor to our GDP. Well i plan to write a series of research papers this year, regarding sectors and initiatives that could really transform the economy. I will tag you once they are ready. Thanks again Onukpa! !